Kylian Mbappe, newest arsenal in PSG armada! The impossible is about to become a reality with Monaco having given the green light to negotiate and and both clubs are now exchanging documentation to finalise the signing. There is complete agreement with no turning back and all that is needed now is for the lawyers to give the nod and then the player will sign. He will become a new Paris Saint-Germain player. End of story. PSG have agreed to pay 160 million euros along with 20 million extra that was part of a previous agreement between Monaco and Real Madrid. In other words, 180 million euros they will splash out to somersault over the deal between Los Blancos and the French club. 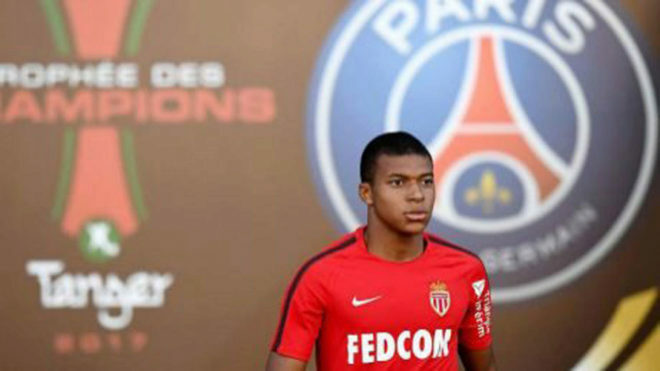 Once Mbappe’s father had convinced Monaco, the negotiation only took an afternoon last Monday and was so quick because the arrangement between the player and PSG was already sorted out with a salary that is out of this world. Other European clubs have been left taken aback by the audacity of the Paris club with 400 million euros spent and the next player is set to be Oblak or other player if Atletico do not agree to sell, as was the case with Monaco until Monday. The father wanted Paris and he told Real while the interest from Barca was fictitious. They never wanted the player but it was of interest to infiltrate this information so that it looked as though they would win another battle against their rival. Now, they have been left empty handed and we will see how everything ends up. Kylian wanted to play for Real, it was his dream but the lure of money was enough to make him decide to play for the club where he was born. The father won and he has an incredible salary. PSG had the Argentine as their back-up plan and they believed that Monaco would not negotiate with them and they would do everything possible so that the player went to Real Madrid. However, the father was key as he told Monaco it was either Paris or nothing and now Mbappe has his destiny in front of him and Dybala is forgotten.